Zenimax Online Studios today revealed an incredibly exciting chapter in the annals of Tamriel with the upcoming addition of The Justice System – a unique feature that will see players fulfilling roles on both sides of the law. 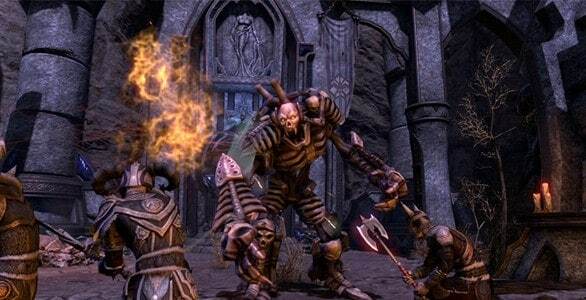 One of the largest complaints prior to launch, and one that can still be heard today, was the lack of thievery within The Elder Scrolls Online, a complaint that’s soon to dissipate with the introduction of a huge variety of features that will support similar crime and punishment opportunities to those seen in other titles in the Elder Scrolls franchise. The news comes from an exclusive column on MMORPG.com in which Ryan Getchell provides a deep insight into the mechanics of The Justice System, taking a detailed look at both The Enforcer and The Outlaw. Those interested in enforcing the law and protecting the innocents of Tamriel will want to locate an Enforcer Tower and collect a special tabard. When equipped the Enforcer’s Tabard allows its wearer to see the crimes of other players in the vicinity, prompting the nearby bringers of justice to intervene and stop The Outlaw. On the opposite side of the scales of Justice is The Outlaw. As a member of the seedier sides of society those that choose to become an Outlaw will be able to steal items, pickpocket treasures and kill enemy NPC’s but not to worry – vital NPC’s are still immune to such actions. If successful Outlaw’s are then tasked with taking the items to special safezones in which they can fence their stolen goods. It’s the job of The Enforcer to catch the criminal and bring him to justice before they’re able to rid themselves of the evidence. Other elements compliment The Justice System feature such as randomly discovered clues that allows for Enforcer’s to discover hidden Outlaw caves that contain well concealed stolen goods with a reward offered for any that are returned to the city. For more information check out the article link below.